Developed with the advice of Microsoft to build the user interface. An all in one, Professional and Responsive Metro Bootstrap theme. Comes with 60 pages and 6 colors (Purple, Red, Light blue, Blue, Green and Orange). Modern and fresh HTML site template built with twitter bootstrap + designed with metro style. This template looks great for modern corporate business website or used for web design agency. A Metro inspired fluid-adaptive admin theme that tries to be as light as posible and put your data and controls in focus, not the theme chrome. It can be customized to be laid out horizontally or vertically. It’s scrollable and dragable at the same time and contains useful sliding controls. Icons can be changed, there is a large collection available. comes by default with an integrated FAQ and manuals systems, thus allowing staff members to decrease response time and improve efficiency. With jQUIT Builder you can build custom jQuery UI themes based on Metro UI. 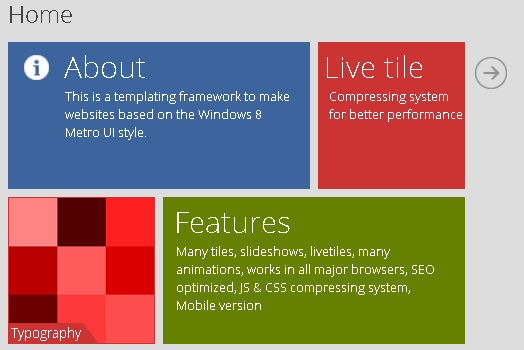 Build Windows 8-style websites with ease.